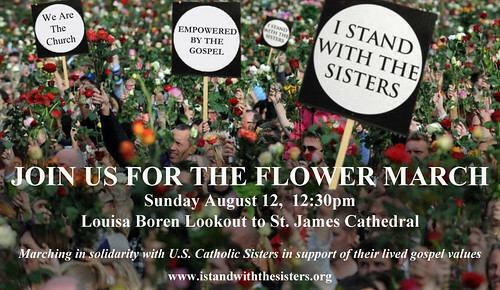 Expect some traffic disruption, but probably not a lot of vandalism or other mayhem in Sunday’s Flower March in support of U.S. Catholic Sisters. The background on this march is that the largest leadership organization for American religious sisters, called the Leadership Conference of Women Religious (LCWR) were being disciplined by the Holy See, in conjunction with the US Catholic bishops. LCWR was ordered to “reform its statutes, programs, and affiliations to more closely reflect “the teachings and discipline of the Church” and to accept the oversight of Archbishop Peter Sartain for the next five years to make sure that the LCWR organizations policies and programs adhere to the Vatican requirements. In other words, quite using your own judgement, quit ministering to folks unconditionaly, be more strident in urging the use of birth control and in condemning homosexuality, and quit urging for changes in the Catholic Church such as the ordination of women. The average age of nuns in the US is 74 years old. It’s safe to say that most of those women have spent near 50 years ministering to the poor, the sick, children, the elderly. They are teachers, nurses, librarians, cooks, cleaners and they serve God. To have their hands slapped, to be disciplined and put under the watch and oversight of the Archbishop is insulting and uncalled for. The protest started in Seattle, but is spreading throughout the US as good folks everywhere realize that this is unfair to women who’ve given their lives completely to the Catholic Church. You can read more about this protest on the website I Stand With The Sisters. This entry was posted in Uncategorized by marlowharris. Bookmark the permalink. Thank you, Capitol Hill blog, for putting a little flesh on the ghost of journalism. None of the other stories I read about this march (Stranger, PI) bothered to say when the march was taking place. Early afternoon? That’s not helpful. Also, your short five paragraphs give the best sense of what’s at stake, and also listed the nuns’ website, with link. Well done. Standing with you sisters as well – wasn’t aware of this and can’t attend, but there all the same – is this attack on Catholic women part of the Catholic patriarchy’s death throes? I prefer to think that rather than we are seeing a new ascendancy of misogony…. I STAND with the NUNS!! !